When you have a game full of people communicating via typing zone names, mobs, NPC names, spells, etc. are bound to be abbreviated. 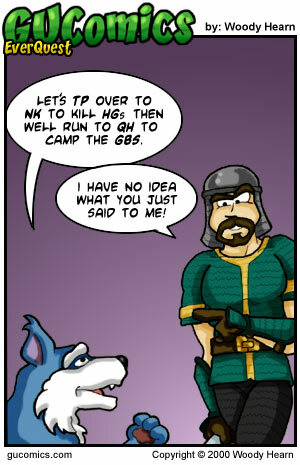 Someone new to the game could very easily see a line of text like the one in the comic and rightfully assume that we'd created our own language. Let's [teleport] over to [North Karana] to kill [Hill Giant]s then we'll run to [Qeynos Hills] to camp the [Glowing Black Stone].